"Feuille" is not a restaurant, at least not conceptually and certainly not in the conventional sense. We do not have fixed business hours and our operations divide between the service and the research and development for the menu. It is our belief that dining should not be only about satisfying our appetite, but also as an overall immersive experience for other sensory organs; dining should be as fun as entertainment analogous to watching a film or a musical while enjoying the conceptual symmetry of indulging other senses in popcorns, a glass of bubbly, or a rich and decadent ice cream. Feuille is not a restautant. It does not have a glamourous facade or artist- accentuated decors nor does it have gold or silver service ware a high end restaurant usually posseses. It is plain, rustic, and minimalistic. What makes it unique though is that we have no prejudice or pretensions when it comes to service and cooking. We strongly believe that details are the fundamental requirement to a beginning of a continously refined and learning service standards. We further believe the only way to look after our guests in detail is to pair the service staff with only a small number of guests because each table is different; it has its own niche and unique habitat and that only an observant and meticulous server dedicated solely to his/her guests of that table can really understand and cater to each guest's needs. 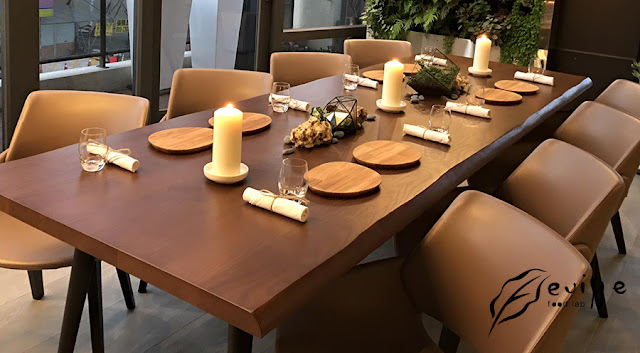 Instead of feuille being a culinay studio with seven tables, it is in fact seven little small dining rooms with their very own butlers and stewardesses. Feuille welcomes you to contact the food studio directly at cs@feuille-studio.com to set up an interview.